A key assumption underlying most present day physical thought is the idea that causation is bottom up all the way: particle physics underlies nuclear physics, nuclear physics underlies atomic physics, atomic physics underlies chemistry, and so on. Thus all the higher level subjects are at least in principle reducible to particle physics, which is therefore the only fundamental science; as famously claimed by Dirac, chemistry is just an application of quantum physics . However there are many topics that one cannot understand by assuming this one-way flow of causation. The flourishing subject of social neuroscience makes clear how social influences act down on individual brain structure ; studies in physiology demonstrate that downward causation is necessary in understanding the heart, where this form of causation can be represented as the influences of initial and boundary conditions on the solutions of the differential equations used to represent the lower level processes ; epigenetic studies demonstrate that biological development is crucially shaped by the environment . What about physics? In this essay I will make the case that top-down causation is also prevalent in physics, even though this is not often recognised as such. This does not occur by violating physical laws; on the contrary, it occurs through the laws of physics, by setting constraints on lower level interactions. Thus my theme is that the foundational assumption that all causation is bottom up is wrong, even in the case of physics . Some writers on this topic prefer to refer to “contextual effects” or “whole-part constraints”. These are perfectly acceptable terms, but I will make the case that the stronger term “top-down causation” is appropriate in many cases. George Francis Rayner Ellis is the Emeritus Distinguished Professor of Complex Systems in the Department of Mathematics and Applied Mathematics at the University of Cape Town in South Africa. He co-authored The Large Scale Structure of Space-Time with University of Cambridge physicist Stephen Hawking, published in 1973, and is considered one of the world's leading theorists in cosmology. He is an active Quaker and in 2004 he won the Templeton Prize. From 1989 to 1992 he served as President of the International Society on General Relativity and Gravitation. He is a past President of the International Society for Science and Religion. He is an A-rated researcher with the NRF. Ellis attended the University of Cape Town, where he graduated with honors with a Bachelor of Science degree in physics with distinction. He received a PhD in applied mathematics and theoretical physics at Cambridge University. Uma Web Verde ou um relógio molecular mega-enviesado??? Key words: divergence dating, evolutionary radiations, geochronology, Gondwana, molecular clocks, paleobotany, Patagonia. Evolutionary divergence-age estimates derived from molecular ‘clocks’ are frequently correlated with paleogeographic, paleoclimatic and extinction events. One prominent hypothesis based on molecular data states that the dominant pattern of Southern Hemisphere biogeography is post-Gondwanan clade origins and subsequent dispersal across the oceans in a metaphoric ‘Green Web’. 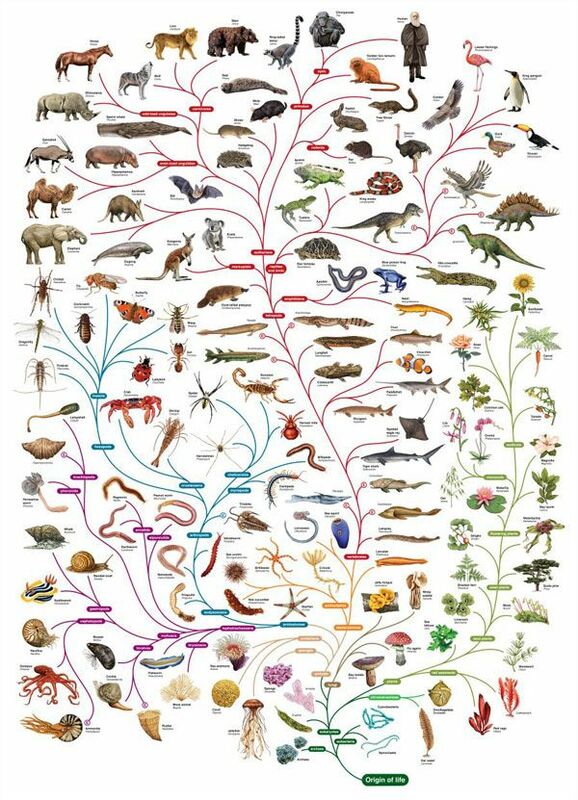 We tested this idea against well-dated Patagonian fossils of 19 plant lineages, representing organisms that actually lived on Gondwana. Most of these occurrences are substantially older than their respective, often post-Gondwanan molecular dates. The Green Web interpretation probably results from directional bias in molecular results. Gondwanan history remains fundamental to understanding Southern Hemisphere plant radiations, and we urge significantly greater caution when using molecular dating to interpret the biological impacts of geological events. We urge significantly greater caution when using molecular dates in the explicit context of geologic time and Earth history. The fossil record is always incomplete, but its exciting potential is only beginning to develop in many parts of the world. Future improvements in molecular dating seem very likely, but for now, fossils and geochronology provide the only rigorous, enduring temporal framework for evolutionary radiations. Valores de apoio filogenético não são, necessariamente, informativos!!! Molecular phylogenies are being published increasingly and many biologists rely on the most recent topologies. However, different phylogenetic trees often contain conflicting results and contradict significant background data. Not knowing how reliable traditional knowledge is, a crucial question concerns the quality of newly produced molecular data. The information content of DNA alignments is rarely discussed, as quality statements are mostly restricted to the statistical support of clades. Here we present a case study of a recently published mollusk phylogeny that contains surprising groupings, based on five genes and 108 species, and we apply new or rarely used tools for the analysis of the information content of alignments and for the filtering of noise (masking of random-like alignment regions, split decomposition, phylogenetic networks, quartet mapping). The data are very fragmentary and contain contaminations. We show that that signal-like patterns in the data set are conflicting and partly not distinct and that the reported strong support for a "rather surprising result" (monoplacophorans and chitons form a monophylum Serialia) does not exist at the level of primary homologies. Split-decomposition, quartet mapping and neighbornet analyses reveal conflicting nucleotide patterns and lack of distinct phylogenetic signal for the deeper phylogeny of mollusks. Even though currently a majority of molecular phylogenies are being justified with reference to the 'statistical' support of clades in tree topologies, this confidence seems to be unfounded. Contradictions between phylogenies based on different analyses are already a strong indication of unnoticed pitfalls. The use of tree-independent tools for exploratory analyses of data quality is highly recommended. Concerning the new mollusk phylogeny more convincing evidence is needed. Stuart Kauffman is professor emeritus at the University of Pennsylvania. He was educated in philosophy, psychology and physiology at Dartmouth and Oxford, and obtained his medical degree from UCSF in 1968. He is an affiliate professor at the Institute for Systems Biology in Seattle. His latest book is Humanity in a Creative Universe (2016). We all sense something deeply deficient in our modern civilisation. Is it an absence of spirituality? Partly. A greedy materialism beyond what we really need? Yes, we are riding the tiger of late capitalism, where we make our living producing, selling and buying goods and services we often do not need on this finite planet. We cannot see ourselves, in part blinkered by unneeded scientism. The central framework of current physics is that of entailing laws. 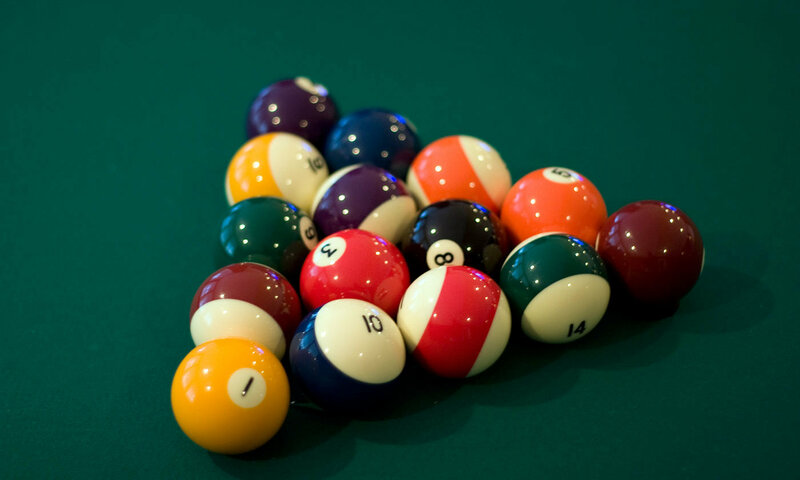 The central image is the billiard table as boundary conditions and the set of all possible initial conditions of position and momenta of the balls on the table. Then, given Isaac Newton’s laws in differential form, we deduce the deterministic trajectories of the balls. Our model of how to do science is to deduce new consequences, test them, accept or reject the results by diverse criteria, then retain or modify our theories. Science proceeds as Aristotle might have wished, in part as deduction. My aim is to begin to demolish this hegemony of reductive materialism and its grip on our scientific minds, and a far wider elicitation of a grossly misplaced scientism in modernity. Science is sciencia, knowledge. Being and becoming are more fundamental to all life and our humanity. We are, first of all, alive, and alive in a becoming biosphere. Despite bursts of extinction events and the fact that 99.9 per cent of all species that ever lived are gone, the biosphere flowers on. This flowering of the biosphere, more than a metaphor for human history, begins to suggest a mythic structure beyond that by which we currently live. At the centre of my argument is a vexing question: since the Big Bang, why has the Universe become complex? I claim that at least part of the answer is that, as more complex things and linked processes are created, and can combine with one another to make yet more complex amalgams of things and processes, the space of possible things and linked processes becomes vastly larger, and the Universe has not had time to make all the possibilities. Consider just carbon, hydrogen, nitrogen, oxygen, phosphorus and sulphur (CHNOPS), the atoms of organic chemistry. Now consider all possible molecules made of CHNOPS with, say, 100,000 atoms or fewer per molecule. (Coal is such a molecule, and the largest known coal molecule is about 1 × 2 × 1.5 miles somewhere in the United States, a single molecule made only of carbon, with far more than 100,000 carbon atoms.) We do not even know how to count the number of possible molecules containing CHNOPS with up to 100,000 atoms per molecule. But it is easy to see that the Universe cannot have had enough time to make them all. A seleção natural não sabe distinguir entre mutações benéficas e aleatórias em um ambiente flutuante! Evolution in variable environments depends crucially on the fates of new mutations in the face of fluctuating selection pressures. In constant environments, the relationship between the selective effect of a mutation and the probability that it will eventually fix or go extinct is well understood. However, our understanding of fixation probabilities in fluctuating environmental conditions is limited. Here, we show that temporal fluctuations in environmental conditions can have dramatic effects on the fate of each new mutation, reducing the efficiency of natural selection and increasing the fixation probability of all mutations, including those that are strongly deleterious on average. This makes it difficult for a population to maintain specialist adaptations, even if their benefits outweigh their costs. Natural environments are never truly constant, but the evolutionary implications of temporally varying selection pressures remain poorly understood. Here we investigate how the fate of a new mutation in a fluctuating environment depends on the dynamics of environmental variation and on the selective pressures in each condition. We find that even when a mutation experiences many environmental epochs before fixing or going extinct, its fate is not necessarily determined by its time-averaged selective effect. Instead, environmental variability reduces the efficiency of selection across a broad parameter regime, rendering selection unable to distinguish between mutations that are substantially beneficial and substantially deleterious on average. Temporal fluctuations can also dramatically increase fixation probabilities, often making the details of these fluctuations more important than the average selection pressures acting on each new mutation. For example, mutations that result in a trade-off between conditions but are strongly deleterious on average can nevertheless be more likely to fix than mutations that are always neutral or beneficial. These effects can have important implications for patterns of molecular evolution in variable environments, and they suggest that it may often be difficult for populations to maintain specialist traits, even when their loss leads to a decline in time-averaged fitness. * Authors to whom correspondence should be addressed. In eukaryotic cells, RNAs are transcribed in the nucleus and exported to the cytoplasm through the nuclear pore complex. The RNA molecules that are exported from the nucleus into the cytoplasm include messenger RNAs (mRNAs), ribosomal RNAs (rRNAs), transfer RNAs (tRNAs), small nuclear RNAs (snRNAs), micro RNAs (miRNAs), and viral mRNAs. Each RNA is transported by a specific nuclear export receptor. It is believed that most of the mRNAs are exported by Nxf1 (Mex67 in yeast), whereas rRNAs, snRNAs, and a certain subset of mRNAs are exported in a Crm1/Xpo1-dependent manner. tRNAs and miRNAs are exported by Xpot and Xpo5. However, multiple export receptors are involved in the export of some RNAs, such as 60S ribosomal subunit. 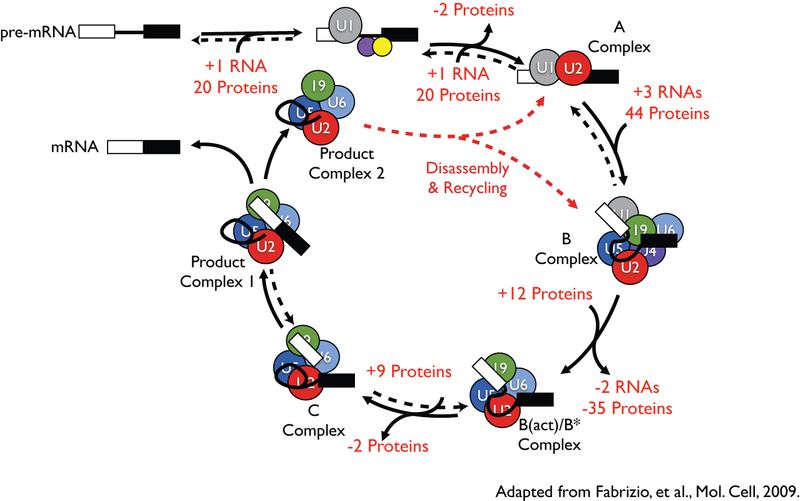 In addition to these export receptors, some adapter proteins are required to export RNAs. The RNA export system of eukaryotic cells is also used by several types of RNA virus that depend on the machineries of the host cell in the nucleus for replication of their genome, therefore this review describes the RNA export system of two representative viruses. We also discuss the NPC anchoring-dependent mRNA export factors that directly recruit specific genes to the NPC. Eukaryotic transcripts contain spliceosomal introns that need to be removed by pre-mRNA splicing. Although several models have been proposed to identify the mechanism of intron gain over the evolution of eukaryotes, they remain models due to a lack of experimental validation. We developed a reporter system to detect selected intron gain and loss events and captured two intron gain events in which the intron derived from the reporter was transposed into the chromosomal loci of RPL8B and ADH2. This is, to our knowledge, the first demonstration of intron gain via intron transposition in any organism, and we suggest that these events are likely to have occurred by a reversal of the pre-mRNA splicing reaction followed by homologous recombination. The presence of intervening sequences, termed introns, is a defining characteristic of eukaryotic nuclear genomes. 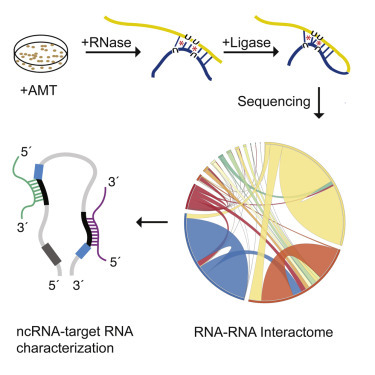 Once transcribed into pre-mRNA, these introns must be removed within the spliceosome before export of the processed mRNA to the cytoplasm, where it is translated into protein. Although intron loss has been demonstrated experimentally, several mysteries remain regarding the origin and propagation of introns. Indeed, documented evidence of gain of an intron has only been suggested by phylogenetic analyses. We report the use of a strategy that detects selected intron gain and loss events. We have experimentally verified, to our knowledge, the first demonstrations of intron transposition in any organism. From our screen, we detected two separate intron gain events characterized by the perfect transposition of a reporter intron into the yeast genes RPL8B and ADH2, respectively. We show that the newly acquired introns are able to be removed from their respective pre-mRNAs by the spliceosome. Additionally, the novel allele, RPL8Bint, is functional when overexpressed within the genome in a strain lacking the Rpl8 paralogue RPL8A, demonstrating that the gene targeted for intronogenesis is functional. 1To whom correspondence should be addressed. Email: scott.stevens@austin.utexas.edu. Author contributions: S.W.S. designed research; S.L. performed research; S.L. and S.W.S. analyzed data; and S.L. and S.W.S. wrote the paper. This article contains supporting information online at www.pnas.org/lookup/suppl/doi:10.1073/pnas.1605113113/-/DCSupplemental. Professores, pesquisadores e alunos de universidades públicas e privadas com acesso ao Portal de Periódicos CAPES/MEC podem ler gratuitamente este artigo do PNAS e de mais 30.000 publicações científicas. Ecological scaling laws are intensively studied for their predictive power and universal nature but often fail to unify biodiversity across domains of life. Using a global-scale compilation of microbial and macrobial data, we uncover relationships of commonness and rarity that scale with abundance at similar rates for microorganisms and macroscopic plants and animals. We then show a unified scaling law that predicts the abundance of dominant species across 30 orders of magnitude to the scale of all microorganisms on Earth. Using this scaling law combined with the lognormal model of biodiversity, we predict that Earth is home to as many as 1 trillion (1012) microbial species. 1To whom correspondence may be addressed. Email: ken@weecology.org or lennonj@indiana.edu. Author contributions: K.J.L. and J.T.L. designed research; K.J.L. performed research; K.J.L. and J.T.L. analyzed data; and K.J.L. and J.T.L. wrote the paper. This article contains supporting information online at www.pnas.org/lookup/suppl/doi:10.1073/pnas.1521291113/-/DCSupplemental. A Royal Society anunciará mudança paradigmática em biologia evolucionária! Finalmente a Royal Society vai anunciar a lista de convidados para o encontro "repensar a evolução"
O escritório de ciência da Royal Society diz que o suspense brevemente acabará. Dentro de duas semanas anunciará os nomes dos apresentadores/tópicos para a conferência — democraticamente, por e-mail, a todos que se registraram para assistir o encontro público. Além disso, eles adicionaram mais convidados na sua lista original. Os zoólogos talvez, finalmente, admitindo que os vírus fazem parte da tenda? Alguém pode imaginar - mais política do que nas Nações Unidas. “Superficial, boba, rasa, e auto-promocional. Eu e muitos outros consideramos isso como um completo embaraço para a área. Se alguém quer ampliar/estender algo em público, especialmente como um biólogo, alguém deve ter uma ideia muito boa do que está sendo ampliado/estendido”. Mais. Não está parecendo como um lugar legal e quieto para dormir. Fiquem ligados. De algum modo, eu venho percebendo uma mudança, em que eu percebo as pessoas abordando novos dados com muito menos acenos retóricos à autoridade do neodarwinismo. 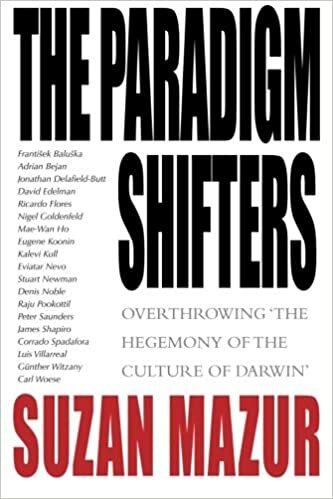 Nota: Suzan Mazur é autora do livro Paradigm Shifters, acima destacado. Vide também: O DNA "Lixo" de volta “com uma vingança”. Provavelmente não é um bom tempo de ser Dan Graur. Na verdade, um tempo melhor de ser Jonathan Wells. Desde 1998 eu venho destacando para a Nomenklatura científica, Galera de meninos e meninas de Darwin, e às editorias de ciência da Grande Mídia Tupiniquim que uma iminente e eminente mudança paradigmática se fazia necessária em biologia evolucionária. Não se importaram, fizeram pouco caso deste "simples professorzinho do Ensino Médio", e outros epítetos demonizando este que a Royal Society agora vindica - VEM AÍ UMA MUDANÇA PARADIGMÁTICA EM BIOLOGIA EVOLUCIONÁRIA! Fui, nem sei por que, rindo da cara dos que apostaram todas as suas fichas epistemológicas no pangaré de Darwin. Eu dobro a aposta na Teoria do Design Inteligente (e seu aspecto de informação complexa especificada) que se não for incorporada na Síntese Evolutiva Ampliada/Estendida, já é uma teoria científica natimorta, pois a biologia do século 21 é uma ciência de informação! Mapeamento global das interações RNA-RNA: o retorno vingativo do DNA "lixo"! Professores, pesquisadores e alunos de universidades públicas e privadas com acesso ao Portal de Periódicos CAPES/MEC podem ler gratuitamente este artigo da Molecular Cell e de mais 30.000 publicações científicas. What used to be dismissed by many as "junk DNA" is back with a vengeance as growing data points to the importance of non-coding RNAs (ncRNAs) -- genome's messages that do not code for proteins -- in development and disease. But our progress in understanding these molecules has been slow because of the lack of technologies that allow the systematic mapping of their functions. ncRNAs come in multiple flavours: there's rRNA, tRNA, snRNA, snoRNA, piRNA, miRNA, and lncRNA, to name a few, where prefixes reflect the RNA's place in the cell or some aspect of its function. But the truth is that no one really knows the extent to which these ncRNAs control what goes on in the cell, nor how they do this. The new technology developed by Blencowe's group has been able to pick up new interactions involving all classes of RNAs and has already revealed some unexpected findings. But design is not a science stopper. Indeed, design can foster inquiry where traditional evolutionary approaches obstruct it. Consider the term "junk DNA." Implicit in this term is the view that because the genome of an organism has been cobbled together through a long, undirected evolutionary process, the genome is a patchwork of which only limited portions are essential to the organism. Thus on an evolutionary view we expect a lot of useless DNA. If, on the other hand, organisms are designed, we expect DNA, as much as possible, to exhibit function. And indeed, the most recent findings suggest that designating DNA as "junk" merely cloaks our current lack of knowledge about function. For instance, in a recent issue of the Journal of Theoretical Biology, John Bodnar describes how "non-coding DNA in eukaryotic genomes encodes a language which programs organismal growth and development." 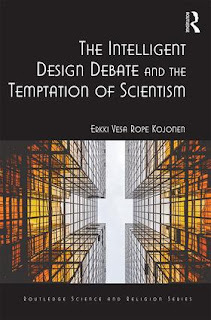 Design encourages scientists to look for function where evolution discourages it. in "Intelligent Science and Design", First Things, Vol. 86:21-27 (October 1998). Então, quem é que impede o avanço da ciência, cara-pálida? Os darwinistas ou a turma do Design Inteligente??? Submitted November 29, 2015. Revised February 17, 2016. Accepted February 17, 2016. 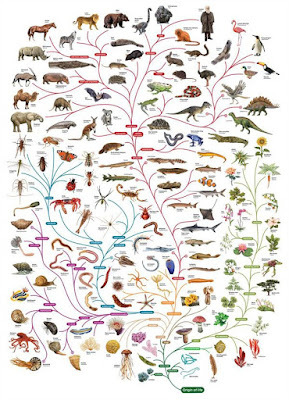 Evolution is a core concept of biology, and yet many college biology students do not accept evolution because of their religious beliefs. However, we do not currently know how instructors perceive their role in helping students accept evolution or how they address the perceived conflict between religion and evolution when they teach evolution. This study explores instructor practices and beliefs related to mitigating students’ perceived conflict between religion and evolution. Interviews with 32 instructors revealed that many instructors do not believe it is their goal to help students accept evolution and that most instructors do not address the perceived conflict between religion and evolution. Instructors cited many barriers to discussing religion in the context of evolution in their classes, most notably the instructors’ own personal beliefs that religion and evolution may be incompatible. These data are exploratory and are intended to stimulate a series of questions about how we as college biology instructors teach evolution. ↵*Address correspondence to: Sara E. Brownell (Sara.brownell@asu.edu). Experimental results in epigenetics and related fields of biological research show that the Modern Synthesis (neo-Darwinist) theory of evolution requires either extension or replacement. This article examines the conceptual framework of neo-Darwinism, including the concepts of ‘gene’, ‘selfish’, ‘code’, ‘program’, ‘blueprint’, ‘book of life’, ‘replicator’ and ‘vehicle’. This form of representation is a barrier to extending or replacing existing theory as it confuses conceptual and empirical matters. These need to be clearly distinguished. In the case of the central concept of ‘gene’, the definition has moved all the way from describing a necessary cause (defined in terms of the inheritable phenotype itself) to an empirically testable hypothesis (in terms of causation by DNA sequences). Neo-Darwinism also privileges ‘genes’ in causation, whereas in multi-way networks of interactions there can be no privileged cause. An alternative conceptual framework is proposed that avoids these problems, and which is more favourable to an integrated systems view of evolution. This paper represents the culmination of ideas previously developed in a book, The Music of Life (Noble, 2006), and four related articles (Noble, 2011b; Noble, 2012; Noble, 2013; Noble et al., 2014). Those publications raised many questions from readers in response to which the ‘Answers’ pages (http://musicoflife.co.uk/Answers-menu.html) of The Music of Life website were drafted. Those pages, in particular the page entitled The language of Neo-Darwinism, were written in preparation for the present article. The ideas have been extensively honed in response to further questions and comments. O diagrama de ligação de um sistema olfativo glomerular: mero acaso, fortuita necessidade ou design inteligente? The sense of smell enables animals to react to long-distance cues according to learned and innate valences. Here, we have mapped with electron microscopy the complete wiring diagram of the Drosophila larval antennal lobe, an olfactory neuropil similar to the vertebrate olfactory bulb. We found a canonical circuit with uniglomerular projection neurons (uPNs) relaying gain-controlled ORN activity to the mushroom body and the lateral horn. A second, parallel circuit with multiglomerular projection neurons (mPNs) and hierarchically connected local neurons (LNs) selectively integrates multiple ORN signals already at the first synapse. LN-LN synaptic connections putatively implement a bistable gain control mechanism that either computes odor saliency through panglomerular inhibition, or allows some glomeruli to respond to faint aversive odors in the presence of strong appetitive odors. This complete wiring diagram will support experimental and theoretical studies towards bridging the gap between circuits and behavior. O que você quer dizer com epigenética?